After several years of visiting Maui and other Hawaiian Islands we found our perfect vacation destination at Kihei Beach! For us, one thing that sets Kihei Beach apart from other vacation spots is that our family has enjoyed it equally as honeymooners, traveling with children, and as retirees. There truly is something for everyone to enjoy at KBC! Our condo is centrally located at one of the most beautiful spots on the island where you will find the most amazing sunsets right from the lanai. Perfect for taking long walks on Sugar Beach, you can swim and snorkel right out front, or just lounge by the pool while the waves crash just steps away. Nothing is more relaxing than sitting on the lanai with a glass of wine in hand listening to the surf and watching the outrigger canoes cruise by while the sun sets on the horizon! Kihei Beach is a moderately sized six story beachfront property located in North Kihei. It offers sweeping views of Kahoolawe, Molokini and the dazzling Pacific Ocean and a friendly casual atmosphere. Fronting the property is Sugar Beach, well known for its romantic sunsets, great swimming, miles of unspoiled strolling beach and seasonal whale watching. 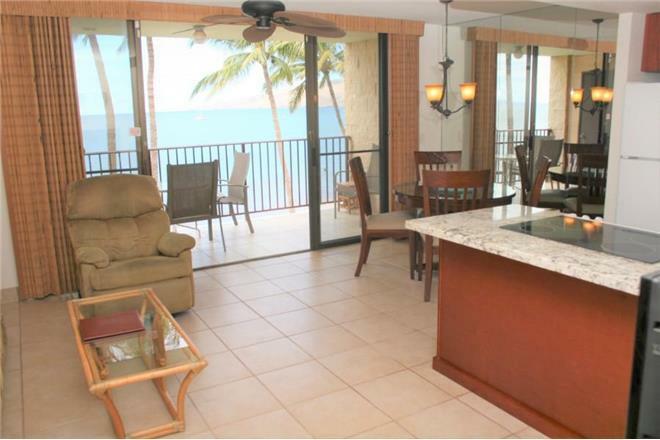 Kihei Beach offers central air conditioning, oceanfront pool area, gas barbecues, laundry facilities and free parking. The interiors include fully equipped kitchens, cable television, free local phone service, private lanais, complimentary high-speed internet service and luxury linens supplied.Photos are representative of the property and may differ from the actual unit that is reserved.Tax Number: TA--01. $129 - $275 per night. 50% down to hold a reservation. Balance due 60 days before check-in. Additional Fees: $98.96 for Reservation Fee and Limited Liability Waiver Fee. 4% processing fee. Listed rates do not include tax. Holiday and peak season rates and required length of stay may be different than quoted above. Credit cards, cash, checks and wire transfers accepted. Minimum night stay varies amongst the various rental units. Many rentals have 30-night minimums. Tax number: W31327863-01. The best part about this unit was the location. The unit was clean (except for the carpet), but it does need to be updated.